Had a great time signing autographs at The Northland Barbershop Chorus' 46th Annual Show "Cowboy Chorale". It was an evening of cowboy poetry and music in the Barbershop style. Thanks for allowing me to be a part of it. I also really enjoyed being invited to the After Party which was fun with skits and entertainment. Mantracker Sidekick Phil ropes 'em in at the college. Mantracker Sidekick Phil enjoys some fishing and some signing. Annie Gerard went to Lemieux Composting for dirt. That's how she found out Mantracker was coming to town. Today she tracked down the tracker. 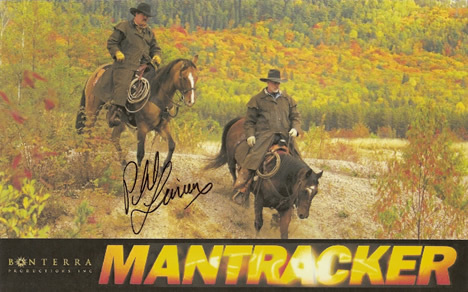 Another popular drawing card at the home show was the appearance of Terry Grant, star of the reality-adventure television show Mantracker. A recent Bowl for Kids Sake fundraiser has raised more than $11,000 for Big Brothers and Big Sisters Associations of Sault Ste. Marie. People have admired him as the star of the Canadian TV reality show “Mantracker.” This weekend, his fans in Sault Ste. Marie get the chance to meet him. He is Terry Grant, and he took time to speak with SooToday. Outdoor Living Network Mantracker star Terry Grant, dropped the puck at the Soo Greyhounds vs Owen Sound Attack game on Saturday, Dec., 1, 2012., at the Essar Centre in Sault Ste. Marie, Ont.